The goals of the United Nations Multidimensional Integrated Stabilisation Mission in Mali (MINUSMA) are to support the re-establishment of state authority throughout Mali and to stabilise key areas, especially in the north. 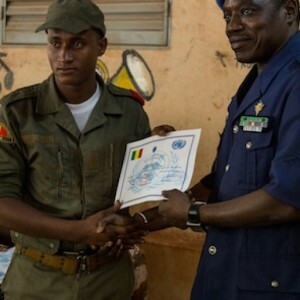 Rebuilding the Malian security sector is one of the core pillars of the mission’s mandate. However, the mission is rapidly falling out of favour with Malians, particularly due to its inability to deploy in the north of the country. This policy brief recommends how the capacity-building aspect of the police component of MINUSMA can be strengthened. Gustavo de Carvalho joined the Conflict Management and Peacebuilding Division of the Institute of Security Studies (ISS) as a senior researcher in April 2014. He has extensive experience in capacity development, policy support and research initiatives in the field of peacebuilding in Africa. From 2009 to 2014 he was with the African Centre for Constructive Resolution of Disputes (ACCORD), first as an analyst in the Training for Peace (TfP) Programme and later as coordinator of its Peacebuilding Unit. Gustavo holds a bachelor degree in international relations from the University of Brasilia and a MSc in African studies from the University of Oxford. Liezelle Kumalo has been an intern in the Conflict Management and Peacebuilding Division of the ISS since March 2014. She holds a BA in politics and economics and a BA(Hons) in politics from the University of Johannesburg. She completed an MA in international relations at the University of the Witwatersrand.